Clockify Time Tracker for Chrome lets you track time from anywhere on the web, without having to open Clockify. Once you install the extension, type what you’re working on and start the timer. To edit the running time, click on the running entry to bring up its details. There you can change the description, change running time, mark time as billable, and add project and tags. You can also edit past time entries by clicking on them. You can also add time manually (once you switch to manual mode in the settings). To quickly continue tracking time, click on the play icon for the time entry you wish to continue, and the timer will start ticking again for that entry. Press Ctrl+Shift+X to start a timer without having to open the extension. If you have a running timer, pressing Ctrl+Shift+X will stop it. Enable default project and the next time you start/stop the timer, you won’t have to manually select a project – it will already be selected! If you work on the same project every day, set a default project. Then, all you have to do is type what you’re working on, start the timer, and the project will be selected automatically. You can enable default project in the extension’s Settings. Note: if you try to stop the timer from another website and you get an error, it means that project is a required field. You’ll either have to manually add the project from the extension, or disable required field (if you have Timesheet enabled, project field is automatically required). 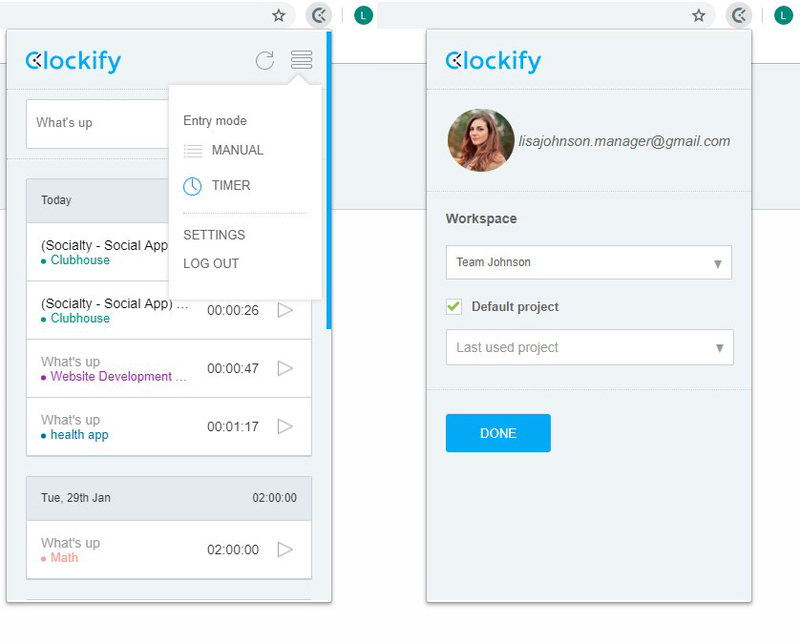 You can also make Clockify work with self-hosted instances of software (like JIRA, Redmine, etc. ), here’s how. Reminders: Get a notification if you’ve forgotten to track time during your work hours. Pomodoro timer: Work in 25min increments and get a notification when it’s time to take a break. Idle detection: Clockify will detect when you’re inactive so you don’t add idle time by accident. Start/stop automatically: Automatically start the timer when you open browser.